Bouncing Back(es) -- As hot as the St. Louis Blues have been during the past several months, they're not going to win every night. 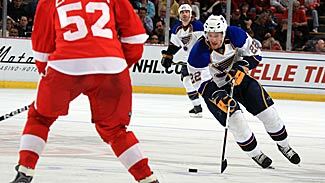 Their five-game winning streak was snapped Wednesday in Chicago, and the critical test came one night later when the Blues traveled to face the defending Stanley Cup champion Detroit Red Wings, desperately in need of two points. It turned out to be a defining night in the career of third-year forward David Backes, and one that could perhaps result in the Blues earning their first playoff spot in five years when the regular season ends in a little more than a week. They currently sit eighth in the Western Conference, one point ahead of Nashville. Backes, who had never even had a hat trick in his NHL career, scored four goals, refusing to let the Blues fall in what became a 5-4 win Thursday night. The game-winner, his 30th goal of the season, came with 4:07 left -- only 36 seconds after the Wings had tied the score. "I don't know what happened," Backes said. "One of those games where you kind of black out and then they're patting you on the back." After breaking into the League with 10 goals in 49 games during the 2006-07 season, Backes upped his output slightly by scoring 13 times in his first full season with the Blues. He had doubled that total going into Thursday's game, but the fact he ended the night tied with Brad Boyes for the team lead was something nobody expected. Fifty sounds fine -- Thursday night saw the Boston Bruins become the second NHL team this season to reach 50 victories. The weekend could see them wrap up the No. 1 seed in the Eastern Conference. Not too shabby for a franchise that barely made the playoffs last season as an eighth seed and was shut out of the dance entirely two seasons ago. "You can play for one team your whole career and never get 50 wins -- and still have some real good seasons," goalie Tim Thomas said after stopping 31 shots to beat the Ottawa Senators 2-1 at TD Banknorth Garden. "It's a credit to the team, the way it's built and the way the guys play together. It's a point well taken, and no one should know it better than the Boston players who were on last season's squad. Despite entering their first-round series as a severe underdog, playing a Montreal team that had won all eight regular-season meetings, the Bruins extended the series to a seventh game before they were eliminated. The Habs were then ousted in five games by Philadelphia in the second round, proving that a high seed only takes you so far. But the Bruins have been playing solid hockey of late and understood the significance of hitting 50 wins for the eighth time in franchise history and the first in 16 years. "We had a tough stretch and now we're heading in the right direction again," Marc Savard said. "I think it'll be more enjoyable tomorrow when we go to the rink for practice; smiles will be on the boys. It's a great accomplishment for us. ... Fifty wins, I wouldn't have predicted it right away and I don't think any of you did either. I think it's a special feat." Partying like it's 2006 -- There haven't been a lot of reasons to celebrate in Raleigh since that June evening three seasons ago when the Carolina Hurricanes disposed of Edmonton in Game 7 of the Stanley Cup Final to capture the franchise's first title. That remains the last playoff game in team history. All that seems about to change, though, as the Hurricanes are enjoying their hottest stretch since that magical season. A win streak that has seen them surge from playoff bubble team to potential No. 4 seed was extended to seven Thursday as a pair of third-period goals keyed a 4-2 victory against the New York Rangers at RBC Center. "The third period, we've talked about it for a while now, making sure we're playing the same way, waiting for our chances, and when we get them, to cash in," center Eric Staal said. "We did that in the third." Chad LaRose and Rod Brind'Amour scored 28 seconds apart to turn a 2-2 game that seemed headed for overtime into two more points for the Hurricanes. They jumped into fourth in the Eastern Conference for the time being, their 93 points one ahead of Philadelphia and Pittsburgh. It's not time to make postseason plans just yet, however, and the team doesn't plan on celebrating anything until there's an X next to Carolina in the standings. Take a deep breath -- Another team that has seen its playoff positioning take a turn for the better in recent days is the Montreal Canadiens. They're hardly out of the woods, but the Habs climbed up one spot to seventh after a 5-1 win against the New York Islanders, combined with the Rangers' loss to the Hurricanes. Saku Koivu, Mathieu Schneider and Andrei Markov scored power-play goals to whip the many Montreal fans who made the trip to Nassau Coliseum into a frenzy. The victory improved the Canadiens to 4-0-1 in their last five and 5-3-3 since Bob Gainey stepped back behind the bench. "It's fun to have your destiny in your own hands," said Alex Tanguay, who also tallied. "We knew that no matter what the Rangers were doing tonight, we knew we had one game in hand on them. And if we just won our games, we were going to move up." Fun isn't always a word that the Canadiens would have used to describe their centennial season -- a little more than a week ago, it appeared the team might be cracking under the pressure of securing a playoff berth. Now, Montreal is showing some of the form it had during an early-season run of success. "We feel good," Tanguay said. "We've played better, and hopefully we can keep on improving. We are a team that felt at the start had a lot of potential. We maybe underachieved but even though we're 77 games into it, the season is still young and we can still make some good things happen." Striving for more -- Having clinched a spot in the Stanley Cup Playoffs, the big incentive for the Calgary Flames to play well down the stretch is winning the Northwest Division and guaranteeing home ice for at least the first round. The Flames took a step in the right direction as Jarome Iginla and Craig Conroy scored goals while Miikka Kiprusoff earned his League-leading 44th win of the season, 2-1 against the Dallas Stars at American Airlines Center. "Making the playoffs is just a step on the way to another one," Iginla said. "We didn't even talk about it afterward. I'm sure we'll talk about it on the bus, but our goal is more than that." Calgary and Vancouver each have 94 points and five regular-season games left. The Flames have two more wins, giving them the tiebreaker and the No. 3 seed in the Western Conference for the moment. Meanwhile, Kiprusoff kept alive his outside shot at making history. If he starts and wins all five of those games, he would break Martin Brodeur's single-season record for victories by a goaltender. "He's one of the best," Dallas' Mike Modano said of Kiprusoff, who made 29 saves. "He's very established and we didn't get much in terms of quality chances." Time running short -- Six losses in seven games has taken most of the air out of the Edmonton Oilers' season, and there isn't much schedule left for them to turn things around. Sam Gagner scored a power-play goal late in the second period to cut their deficit in half, but the Oilers were stymied by Evgeni Nabokov otherwise and lost 2-1 to the San Jose Sharks at Rexall Place. They've lost six of seven to fall four points out of eighth with just four regular-season games remaining. "It's disappointing," Gagner said. "The battle level and the intensity were there. The guys were working hard and creating a lot of chances. Obviously at this time it comes down to results though. We aren't out of anything yet and we have to pick ourselves up for the next game." On the flip side, the Sharks are two points closer to gaining the top seed in the Western Conference as well as home ice throughout the playoffs. They took a six-point lead against Detroit, which lost to St. Louis, and maintained a three-point lead on Boston, the No. 1 seed in the Eastern Conference. "We do care about the points, but we care more about the way we play," Nabokov said. "With a lot of guys out of the lineup we have to tidy it up a little bit. We have to be disciplined and that's what we are right now." Montoya's the man -- He's no longer perfect, but Al Montoya remains unbeaten in his brief NHL career. One night after blanking Colorado in his debut, Montoya added to his fast start by making 20 saves and leading the Phoenix Coyotes to a 2-1 win against the Los Angeles Kings at Jobing.com Arena. Montoya gave up his first goal in the League when Derek Armstrong solved him with 2:30 left in the first period, but his teammates made up that deficit in the third as Ed Jovanovski and Scottie Upshall scored. "To get a win at home, there's nothing like it," Montoya said. "I just want to keep making those saves and giving the team a chance to win every night." With the Coyotes eliminated from the playoff race, coach Wayne Gretzky is resting starter Ilya Bryzgalov and taking a long look at Montoya, who was acquired a little more than a year ago from the Rangers in a trade-deadline deal. "He made key saves when he needed to make key saves," said Gretzky, who will start Montoya again Saturday in Los Angeles. "We've had an overall solid defensive effort two games in a row when we didn't give up a lot of opportunities." Winning a wild one -- Their game Thursday night was a shootout in every sense of the word, and the Anaheim Ducks prevailed in the end, which was the only thing that mattered. Corey Perry had a goal and an assist during the first two periods, which saw a total of 10 goals evenly distributed between the Ducks and Vancouver Canucks. After overtime failed to produce a winner, Perry scored the only goal of the shootout for a 6-5 win at General Motors Place. While the Canucks clinched a playoff berth with the one point they received, the Ducks moved from eighth into seventh by getting two. "We live another day," Anaheim coach Randy Carlyle said. "It's the most important game of the season at this point. They all are at this time. When you're in a desperate situation as we are, there's no other way to explain it. Every point is precious and more precious as the games dwindle down." Ducks rookie Bobby Ryan, who had another multi-goal game and added an assist, likes what the team has shown in winning eight of its last nine after falling as low as 13th in the Western Conference. "We feel like we belong in the upper echelon in this conference and it's been a long year with a lot of inconsistency and if we can manage to peak at the right time then hopefully we can create some damage," Ryan said.